With his signature smile and long, whitish beard, Hazem Abu Ismail, can still be seen on posters all across Cairo - on cars, roadsides and even on the walls of some schools and government buildings. His short-lived presidential campaign, unambiguously calling for a tighter application of Sharia, or Islamic law, quickly gained appeal among ordinary Egyptians. It also produced some of the most surprising drama of the political race. 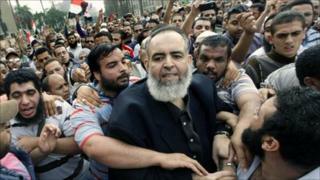 Well-known for his anti-American rhetoric, Mr Abu Ismail, a lawyer and television preacher, was told he was disqualified after it emerged that his dead mother had a US passport. This made him ineligible under election laws that specify that the parents and spouse of a presidential candidate must only ever have held Egyptian citizenship. For Egypt's leftists and liberals, the development inspired a tide of irreverent jokes at his expense on social media. However, there could be a much more serious side to the end of Hazem Abu Ismail's presidential bid. His angry supporters spent the night outside the presidential election headquarters building in northern Cairo after it rejected his appeal against the decision. There have been clashes with security forces. "If Sheikh Hazem doesn't succeed, there will be another revolution in this country," said one Salafist, Mohamed Said. "This man's reputation has been torn apart. It is a conspiracy by the United States and Egypt." The "sheikh" has consistently shown an ability to bring out large crowds. At his rallies, he has sometimes looked like he is in danger of being crushed by the sheer numbers of enthusiastic fans. Hardline Islamism mixed with charisma has been the secret to his popularity. It helped him turn from a fringe candidate into a mainstream contender. "We love him because he is a Muslim and will enforce Sharia law. This is in the interests of all Egypt," said Abdullah Mohammed at a support rally. He wore a mask of Mr Abu Ismail's face over his own long beard and held up an Egyptian flag. "President Mubarak made us eat bread with salt but Sheikh Hazem will let us eat bread with butter," he added. "He has many good ideas." Mr Abu Ismail, who is 51, has expounded his political beliefs in weekly lectures at the Asad Ibn al-Farat mosque in Cairo and in TV appearances. His main message has been the need to impose Islamic law "gradually". For example, he wants to "create the conditions" whereby all women would, over time, be persuaded to wear a headscarf as a religious duty. He also aspires to stop married women from working once they have children, and ultimately to segregate the sexes in the workplace. Egyptian liberals have been in turn, outraged and bemused, by suggestions Mr Abu Ismail has made in video clips that have been widely circulated on the internet. In one, he suggests that requiring girls to be aged over 12 before marriage goes against holy law and in another, he claims that nutmeg should be avoided because it could have drug-like properties. Many experts dismissed his economic and social plans as unviable. These included an idea to make the Sinai desert green, using charity to supply building materials and thus lower housing costs, and abolishing prisons to replace them with rehabilitation centres. Hazem Abu Ismail's political vision has provided his critics with a lot of material for making fun. One politics student produced his own video, parodying the hit by the rock band AC/DC, Highway to Hell. His song, Highway to Abu Ismail, includes the line: "Forget the beer and aniseed drink. No bikinis or spaghetti-straps for women." Yet the one-time challengers of Mr Abu Ismail may be able to learn a lot from his campaign. The first lesson is not to overlook the power of a portion of Egyptian society with ultraconservative or Salafist religious beliefs that feels it has been overlooked and disenfranchised in the past. This was already demonstrated by Egypt's parliamentary election, in which the Salafist Nour party took a quarter of the seats in the new parliament. The success of the grassroots movement that built support for Mr Abu Ismail contains a second lesson. His aides insisted that supporters paid for their own poster runs and then sold them to others, feeding the money back into the campaign coffers. "The Sheikh did not pay anything, only the brothers, and we sell these items at low prices," a Salafist salesman, Ali, explained as he showed off a range of T-shirts with the candidates' legend - "We will live in dignity" - as well as key chains and posters. "We pay because we love Islam." While such items may soon be reclassified as political memorabilia, Mr Abu Ismail's rivals have not yet come close to energising voters in the same way.